Baby sitting for youngest daughter and friend and having to go out later to perform the Friday night taxi service collecting from a sixth form disco. I bought the partridge last week from Wards and put it into the freezer until needed. Tonight seemed like a good idea although it would miss the few glasses of red wine I would otherwise have had with it. It was browned in olive oil and then put to one side whilst I sweated half an onion. A sugary caramel smell came off the pan and I remembered it was the same pan in which I had cooked two quince a few weeks ago in a mixture of syrup and water. Obviously I should have done better with the washing up but the sweetness would add some more depth to the flavour. Once the onion was loose I threw in some finely chopped pieces of bacon and a few cloves of garlic. That all cooked through for a few minutes before the partridge went back in together with a slug of white wine vinegar, two slugs of white wine and a dash of water. I then added a pinch of saffron, two cloves, pine nuts and a couple of bay leaves. There was an old carrot and potato in the cupboard so those were peeled, chopped up and thrown in as well. The lid went on and it went for an hour. It was just right for a cold evening with the threat of frost in the air. Most of the liquid had gone taken up by the carrot and potato. 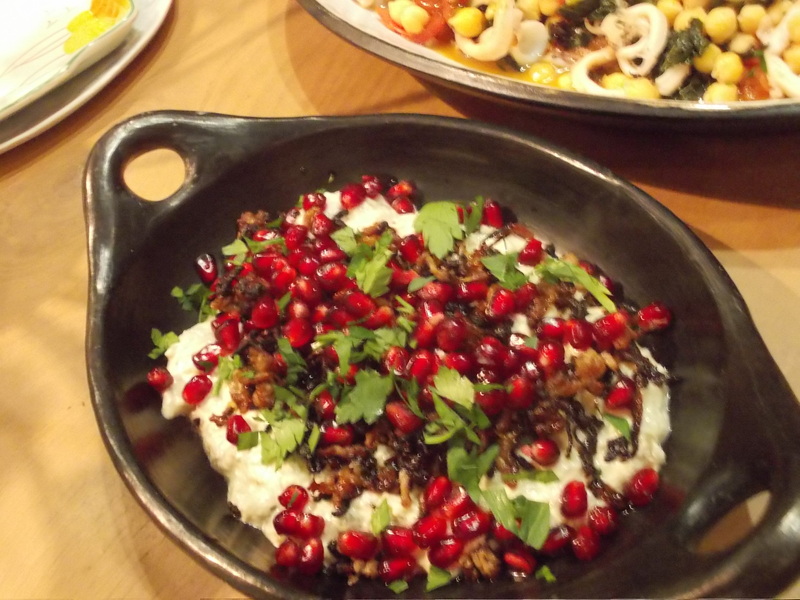 There was a slight sweetness about it and the spice of the cloves and bay leaves. The partridge fell apart at the touch of the knife and there were bones to chew over. The recipe came from a new book You’re All Invited by Margot Henderson, the wife of Fergus. A Friday night at home means a visit to Probe. Through its various locations around Liverpool I have been buying music from Probe for about 30 years. We are just about on nodding terms. I got the new album by Viv Albertine and Julie Holter’s Tragedy. Last week when I made a bowl of chicken and noodles I had been meaning to make something else. I knew that somewhere I had a recipe for Chicken and rice. I managed to convince myself it was in the David Thompson book of thai street food and I spent 10 minutes leafing through the book to try and find it. I became suspicious that although it was only chicken and rice it had somehow managed to hide itself behind some other ingredient in the index but it was still not there. So I gave up on the chicken and rice and fashioned myself a bowl of noodles instead. I turned my mind back to the same recipe this morning and picked up the David Thompson book again and as I did so I remembered where it had come from. It was a book of Vietnamese cooking that Rachel gave me a couple of years ago The Songs of Sapa by Luke Nguyen. One of the best meals we had in Australia two years ago was Vietnamese. It was a basic restaurant on the edge of Chinatown in Sydney serving no alcohol so I had to go to the pub round the corner to get my beer. There was confusion over the menu and in my enthusiasm I started to assume that the first food that arrived was mine and managed to eat Andrea’s vegetable stuffed rice noodle rolls. They were delicious, as were the quails and plain boiled rice that eventually arrived or me. An enduring and proper mixture of the sweet, sour and pungent. The chicken and rice was almost as simple to make as the chicken and noodles. A large pan was put on the stove and oil added. A whole chicken was thrown in together with a chopped onion, chopped ginger, chopped garlic, the green ends of some spring onions and seasoning. The seasoning being a good dash of sugar, a tablespoon of prawn paste and a teaspoon of tamarind pulp. Water was added to cover the chicken and it was all brought to the boil then turned down to simmer for 45 minutes until the chicken was cooked through. The chicken was fished out of its pot and put somewhere to be kept warm. The flavousome stock was drain and the pot back on the stove with a dash of oil in which I cooked off some finely chopped ginger and garlc. Once that was sizzling I tipped the rice in and stirred that through. The stock was poured back in and brought to a good simmer until the rice was cooked. Shortly before the rice was done I pulled the meat off the chicken. Once the rice was done it all went into a large bowl and the shredded chicken put on top to be decorated with a few chopped spring onions, red pepper and coriander. 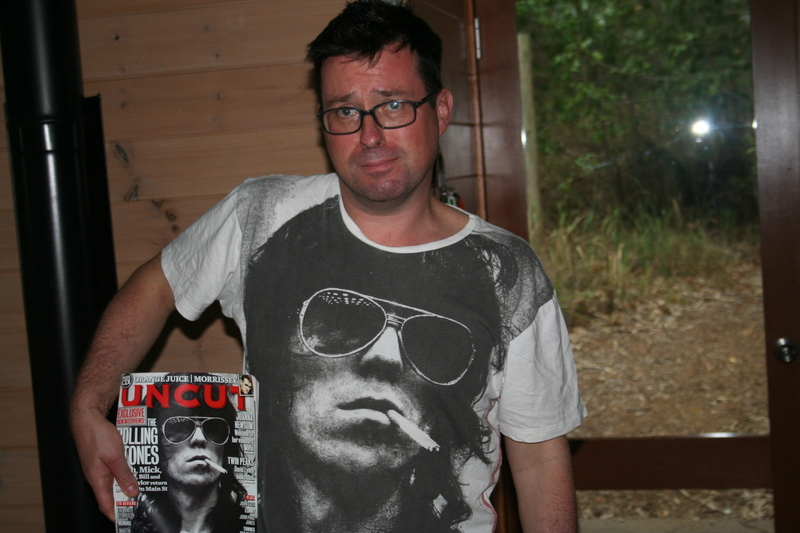 This evening I have been reading the music magazines and their end of year round ups. No mention of Andrew Bird which until Dexy’s was my album of the year. We have just listened to it again and I don’t think I am wrong. Better than Leonard Cohen & Jack White anyway. I could blame it all on Pete Buck. Back in the day when REM were releasing their first few albums and Michael Stipe’s lyrics were a blur against the swirl of the music there was an interview in one of the rock weeklies, probably the NME and probably still in my attic, and Buck was asked about whether it mattered, no one could understand what the words were about. Buck answered that Exile on Main St was one of his favourite albums and there were barely two words on that he could make out. That did it for me. I of coarse knew The Rolling Stones – Paint It Black, Brown Sugar and Satisfaction had all been danced to and enjoyed and I could still still remember the first time I heard Sympathy For the Devil on a copy of Rolled Gold borrowed from Rupert Higgen, but Exile on Main St was still a mystery, there were no familiar titles and all that I had read about told me of murky guitars, cash register pianos and a slurred, incoherent, inchoate sound contemptuous of its audience. I can’t remember where I bought it on vinyl the two discs housed in the black and white snapshots of carney life and the band at half tilt. There is no barcode on it so it must have been some time ago. It took some years for the music to work its way into me. Even now I would struggle to name all of the songs and to put them into some sort of order. They blur into and out of each other. Although on the one hand it sounds cobbled together and too long there is no other way that it could work but taken as a whole. It is normally enough to listen to the opening few seconds the curl of the guitar and Mick Jagger’s whispered oh yeaaa before the drums and the rest of the band kick in and you are drawn into its world. It is one of my favourite Friday night sounds. Put me on my desert island and all I would need to listen to would be those few opening moments. They did of course play the O2 Arena on Sunday evening and 3 songs from Exile on Main St were let out for the evening. I am sure that if I had been there I would have got a thrill from watching and hearing them crunch their way through All Down the Line and Tumbling Dice and who knows they may have carried it off with the right amount of sway and swagger but I doubt it. 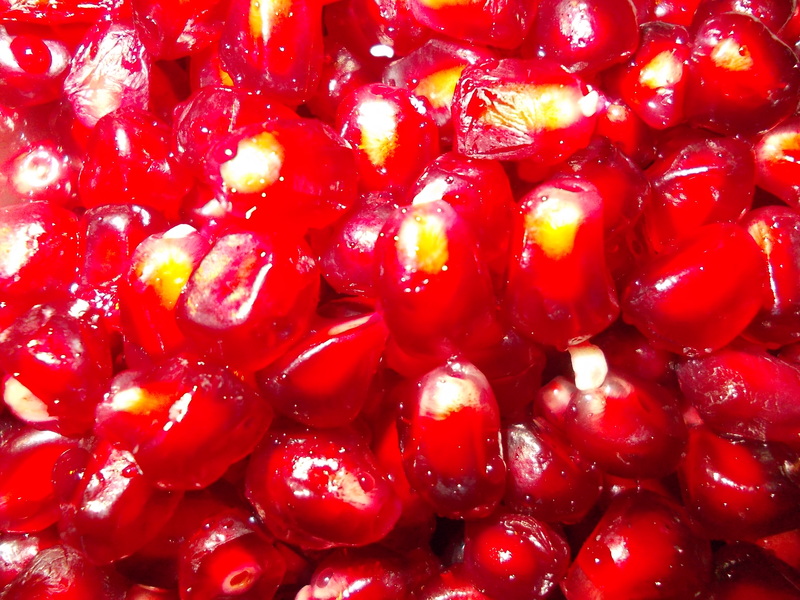 A pomegranate is one of the sensual fruits. Hardly a fruit under the tough leather red skin all it is is a tight compact grouping of seeds each made up of a small husk and a deep purple burst of juice. Its the same purple as beetroot, staining as at scatters across the kitchen. One of them will last for a week or so in the fruitbowl. If you see one buy it even though you may have nothing planned for it you will find something to do with it. For the last week or so the grocers have had them, 49p for a small one a bit more expensive for a large one 5 inches across. You will need a sharp knife to split it, pierce the skin then drag the blade down, smell it and take in the deep musky smell. Use the nib of the knife to prise out one of the seeds and bite into it, the skin bursting and the sudden escape of flavour as the husk gets chewed. There is a fiddle to extracting all of the seeds. A bit like the pith round an orange there is a white skien of inner skin that needs to be got rid of. 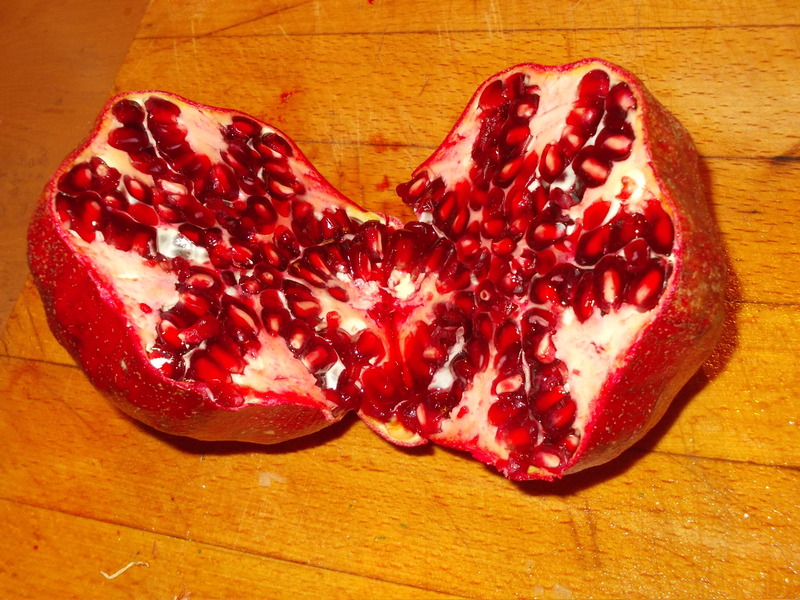 The best way to do it is to spread the fruit with your fingers so the seeds are exposed and brush them off into a bowl. Last night I scattered the seeds over aubergine with yogurt. There were two bowls. One for the vegetarians and another with a bit of meat – minced lamb fried at a high heat with onions and cinnamam. 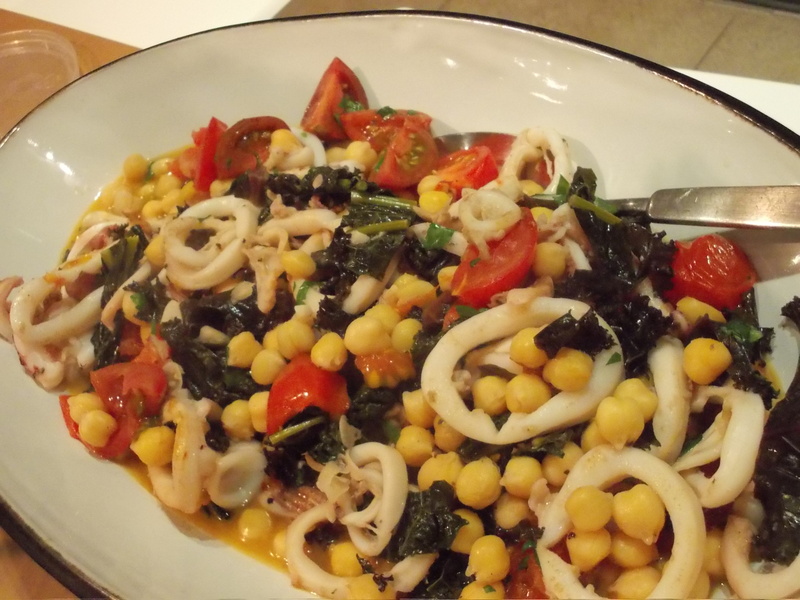 There was another plate of tomatoes and peppers fried with caraway seeds and a larger bowl of the squid quickly fried with chickpeas and kale. After that we had red mullet on linguine followed by 7 quinces in cream. the quinces were cooked for an hour in a low oven with a good scattering of sugar, water and a vanilla pod I found in the basement which I think must be at least 18 years old.